Adobe announced OpenType-SVG colour fonts to Illustrator CC at Adobe MAX this year - meaning you can install colour fonts to your system and also create projects that use fonts with colour, gradients and transparencies for the first time. And just for this week you'll be able to download an array of free fonts. Adobe is working with Fontself for the entirety of this week to showcase all the possibilities of colour fonts, including providing tips and tricks on using using colour fonts, and how to make your own with Fontself Maker - an extension for creating fonts in Illustrator CC and Photoshop CC. Check out how, in a video posted on the Fontself website. If you follow Adobe on social media, or #colorfontweek, look out for the free colour fonts created by designers every day day this week at 8am PDT, including Aires by Yai Salinas, Popsky by Igor Petrovic, and Abelone by Maria Gronlund. The fonts will only be free until Sunday. OpenType-SVG is a font format in which an OpenType font has all, or just some, of its glyphs represented as a scalable vector graphics artwork (SVG) - allowing the display of multiple colours and gradients in a single glyph. This is why Adobe refers to OpenType-SVG as "colour fonts". "Colour fonts like Trajan Color Concept and EmojiOne Color will appear just like typical fonts in your font menus but they may not display their full potential, since many programs don't yet have full support for the colour components," Adobe explains on its blog. "If your software doesn't support the SVG artwork within the fonts, glyphs will fall back to a solid black style. Colour can still be applied to this fallback style, as it will work like a typical OpenType font." This is an open source colour font built by Adobe from artwork designed by Denis Denz and produced by Rick Moby. The font contains all of the emoji in Unicode 9.0 and includes support for ZWJ, skin tone diversity, and country flag emoji. Get EmojiOne Color on Github here. This is part of the Adobe Type Concepts program for early releases of new typefaces. It was designed as an internship project by Srgio Martins, colorizing Carol Twombly's Trajan typeface. The font contains 19 different color variations, plus two black and white options, accessible via OpenType stylistic sets. Get Trajan Color on Typekit. 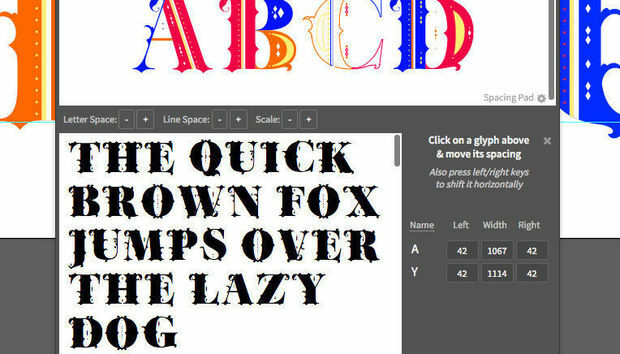 Or, learn how to use OpenType-SVG fonts in Photoshop or Illustrator here. Adobe says there's still a lot more to be learnt about these fonts and how they can be used, so if you're a font developer it's worth getting in touch.